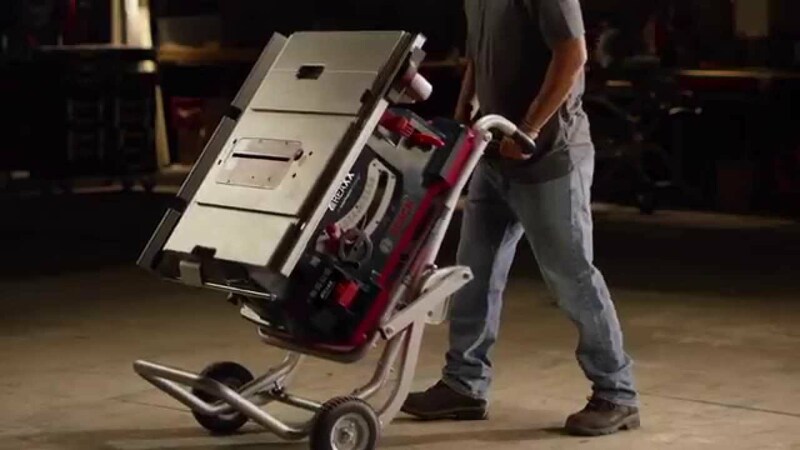 Finding the best table saw under 1000 for the shop or work site can be daunting. Table saws are made with different jobs in mind, so what is best for you may be unwell for another. Some saws are made only for shop use and others are made to be easily transported to the workplace. Some are made for tiles or stone and others are general usage. 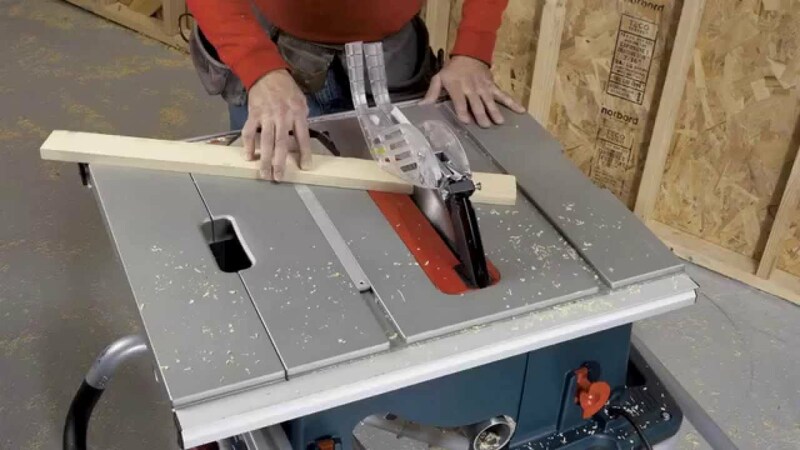 The best table saw under 1000 for many people is a saw capable of performing a variety of cutting tasks while still being easy enough to transport. The saws listed below are some of the best that are commonly available and land under the 1000 mark if on sale, at least. Furthermore, they are all easy enough to order online for your connivence. The Bosch 4100-09 is truly made for the work site. The gravity-rise stand is well constructed with 8 inch pneumatic wheels allowing you to roll the saw over the rough ground of a job site, instead of carrying the 99 pounds of weight. Set-up and take-down is easily accomplished and the table saw folds to save space when transporting or not in use. An important feature in any table saw is the ability to cut accurately, and the Bosch 4100-09 performs this admirably. The Squarelock rip fence is best-in-class and made to ensure that every cut is precise and accurate. The fence is easy to use, even with only one hand and locks in place quickly. The cutting table is 29”x21.5” and can rip through material of up to 25 inches wide. The 10 inch blade can cut at a maximum depth of 1-7/8 in. at 45 degrees and 3-1/8 in. at 90 degrees. Bevel cuts are possible between -2 and 47 degrees and dado cuts up to 13/16 inch. The arbor size is 5/8 inch. There is a digital measuring system allowing measurements for cuts to 1/32 of an inch, but is sold separately. Bosch provides for user safety with its own Smart Guard System. The system is clear and gives great visibility when making precision cuts. 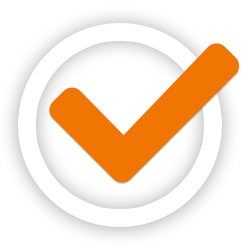 The Smart Guard helps to avoid all kick-backs and contact with the moving saw blade. The system is composed of 3 pieces including the anti-kickback pawls, riving knife and see through blade guard. The Smart Guard System has tool free set-up and can be installed in a few seconds. The Dewalt DW744XRS isn’t far behind the Bosch when it comes to portability and job site convenience. The saw weighs in at only 58 pounds, so is light enough to carry anywhere, while the pair of rugged wheels makes rolling the saw over rough ground easy. The stand folds and is made with heavy-duty aluminum. The 15 amp motor runs at 3650RPM and gives enough power to cut through hardwoods and other materials. The saw has a 24 inch rip ability and cuts dados up to 13/16 inch wide. The 10 inch blade has a cut depth of 3 1/8 inches at 90 degrees and 2 ¼ inches at 45 degrees. An electronic feedback keeps saw speeds stable while a motor mechanism stabilizes the arbor and helps to stop any vibration; aiding a clean and accurate cut. The rack and pinion fence configuration is quick and easy to adjust while providing a smooth and precise cut line. These features are aided by a generous 26 by 19 ¼ work surface. This saw is exactly what it says it is. A wet tile saw that is easy to transport, carry and set-up and weighs only 53.6 pounds. The saw measures 34” x 26”. The DEWALT D24000s is powered by a 1.5 HP motor that can cut through stone and tile. The rail system is cantilevered and allows rips of 24 inches and 18inches on a diagonal cut. The motor will tilt and lock at 45 or 22.5 degrees, so cutting V-caps and pavers is possible. Plunge cuts make quick work of outlets and more. The 45/22.5 degree miter feature is integrated into the frame of the saw and helps ensure accurate measurements and cuts. The saw’s 10 inch blade can cut up to 3-1/8 in. deep. Two adjustable water nozzles make sure that water is sprayed on the blade correctly and a 5 gallon pan holds over spray. The Bosch 4100 10 is proven to be durable at the work site. Built in carry handles and on board tool storage add to its convenience. The Bosch SquareLock Rip Fence has auxiliary slots and a t-slot miter gauge and rips up to 25 inches. The rip fence always insures an accurate cut and is helped by a single point bevel movement. The motor is designed with the Constant Response Circuitry and Soft Start that enables a smooth and easy start-up speed for accuracy and helps maintain a constant power when under a work load. This saw also has the Smart Guard System that features the clear blade guard, riving knife and anti-kick pawls. This saw is made with remodelers, furniture makers and contractors in mind. The stand is ruggedly designed to be useful at the shop or job site. Storage space is provided to hold many tools or accessories. The Makita 2705X1 has a 15 amp motor that gives 4800 RPM. The saw can cut up to 3-5/8 inches deep at 90 degrees and at 45 degrees can cut to 2-1/2 inches deep. A dado blade of up to 13/16 inch may be used as well. Sheets measuring 4 X 8 feet can be ripped using the table extension. 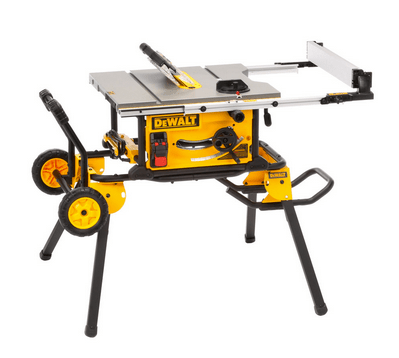 Professionals will love the ability of this table saw to aid in achieving exact cuts. The table top is designed to aid precision and does include a 3/8 X 3/4 inch T-slot miter gauge with grooves to firmly support the material for crosscutting jobs. Safety is provided with the tool-less modular blade guard and an adjustable riving knife. The saw measures 24.6 X 22.4 X 28.6 inches and weighs 85 pounds. This Makita is a solid performer as a contractor table saw and is very capable.